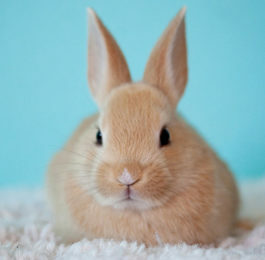 When you first add a pet rabbit to your family there are a lot of things to buy that are considered rabbit essentials. In addition to a cage, toys, food, and all the other day to day supplies, you will also need to purchase some sort of rabbit carrier or travel cage. A rabbit safe carrier is essential to easily and safely transport your rabbit whether you’re traveling or on your way to the vet. While you may think a rabbit carrier isn’t important to buy right away, you never know when there will be an emergency and you’ll need to drive your bunny to the vet or animal hospital at 2 a.m. on a Wednesday. In this article, we’ll cover everything you need to take into consideration when selecting a rabbit carrier for your pet bunny. Whether you need a carrier for air travel or visits to the vet we have recommendations for you. We’ll also look at travel rabbit cages and collapsible rabbit cages. If you need a cage to transport your show rabbit in or just a travel cage to keep your bun comfortable on a road trip, we have options for those as well. Perfect Size – A travel carrier for your rabbit shouldn’t be too small and also shouldn’t be too large. You should look for a “just right” size that will change depending on your rabbit’s size. If you have a Netherland dwarf rabbit you will need a much smaller carrier than other breeds. The general rule of thumb is that the carrier should be large enough for your rabbit to stand up, turn around, and lay down. You should always select a smaller carrier rather than a larger one for your rabbit’s safety. In a large carrier, it is easier for your rabbit to slide around or be injured if there’s a sudden stop or a car accident. Solid Material – Rabbit are voracious chewers and can also be little escape artists too. A hard sided carrier is the best choice for a rabbit. Look for hard plastic and wire on the sides and top. It not only physically protects them on car or plane rides, but it prevents them from chewing through the carrier and escaping. Fabric and soft-sided carriers are easy for them to chew through and not recommended, especially for long trips. Good Ventilation – To prevent your pet rabbit from overheating, the carrier you select should have adequate ventilation to allow airflow. This is one of many reasons why a cardboard box is not a good rabbit carrier. Easy Access – Whatever rabbit carrier you select should make it easy for your bunny to get in and out of it. Usually, they will feature a door that your rabbit can walk in, but you should also look for a carrier that has a top door or a removable top. This is essential for those moments when your terrified bun refuses to leave the carrier at the vet. Easy to Clean – A hard-sided carrier with a solid plastic bottom is usually easy to clean and wipe out with paper towels. You’ll also want a carrier that is easy to take apart if you need to wash it down with a hose or rinse it in the sink. Easy to Transport – Smaller carriers should have a sturdy handle that is firmly attached to the carrier and will stand the test of time. If you’re transporting more than one rabbit at a time, you may want a carrier with a shoulder strap or something with wheels that you can push or pull around. Some airlines will allow you to fly with rabbits, either as cargo or in the cabin with you. If you need to fly with your pet bunny you should contact airlines well in advance of your trip to find out what regulations and rules that have regarding traveling with a pet rabbit. They will also have rules about what kind of carrier your pet can travel in and may require pre-approval or ask you to buy a carrier from a list of approved models. These carriers meet the recommendations listed in the previous section. Make sure to pay attention to the size measurements and purchase a carrier correctly sized for your bun. Remember that airlines will have their own rules for approved carriers. Designed with dogs and cats in mind, this carrier from petmate is perfect for transporting bunnies as long as you get the 19″ size (if you’re looking for a carrier for two rabbits at once, upgrade to the 24″ size). Made from hard plastic with a steel wire door, this carrier is sturdy and will prevent your rabbit from making an escape attempts. It also features two entry doors: a double latch side door and a top door for easy removal of nervous buns. The sides, door, and roof of the kennel feature plenty of ventilation to keep your rabbit cool. This model of Petmate travel carrier is made of two pieces for the top and bottom. They are attached with bolts and wingnuts to easily take them apart to clean the inside of the carrier. This rabbit carrier also comes with a water cup to easily offer your rabbit food or water on the go. Made in the USA. This travel carrier is a favorite among rabbit owners. It’s designed for dogs, but it’s solid side and easy to use clam shell opening is great for transporting dogs. It’s also the right size to fit under an airline seat if your rabbit is flying in cabin (make sure to call your airline to find out if it is approved for travel). If you’re unfamiliar with this type of carrier, you’re probably wondering how your rabbit gets inside. The gray latches on the side slid open and the entire top flips open like a clam. This makes it easy for your rabbit to hop in and out or for you to pick them up. It also makes cleaning a cinch. The sides are made of sturdy plastic and feature ventilation slots to prevent your bunny from overheating. Even though this is designed with air travel in mind, this carrier is also a great option for car rides and trips to the vet. Many rabbit owners buy a small litter box to put inside this carrier since there are slits all around the bottom. The pan makes it easy to put in hay, treats, toys, newspaper, and other items to make your rabbit’s trip more comfortable. I will note that the height of this kennel is only 8″ tall, so if you have a larger or taller rabbit, this may not be a comfortable option for them. If you’re looking doe another affordable, kennel style carrier for your rabbit, AmazonBasics has a nice option. This is designed for cats and small dogs, but the 19″ size could work for many rabbits as well. Made from durable plastic with a steel wire door, this carrier is a safe and sturdy opton. The ventilation holes on this model are smaller and maybe a good option for nervous rabbits who want to feel more protected. There are two doors: the wire side door and a plastic door on top. The top door can open to the left or the right depending on which option is most convenient. If you’re worried about cleaning the AmazonBasics rabbit kennel, it’s as easy as most of the options. The top and bottom half of the carrier snap together and can easily come apart to wipe out or rinse down the inside of the carrier. If also features loops on the front and the back of the carrier if you want to attach a strap for easier carrying, but the handle on the top will work for many situations. If you want to transport two rabbits at once, the 23″ model may work for you. If you have a small rabbit or a young bunny many of the above carriers may be too big for them. Instead, you might want to consider this small pet carrier from Living World. In this case the large size may be the one you need to transport your bun. Made from a sturdy plastic, the top and bottom securely fit together and easily come apart to remove your dwarf bunny and clean the inside. The top is a clear plastic lid that pops open to lift your rabbit in and out and also provides an easy way for you to see them when they’re inside. Slits along all the sides of this rabbit travel carrier allow ventilation to keep your rabbit cool. There are also two handles built into the top to safely carry your pet. This carrier is quite small (designed for rats, guinea pigs, and other smaller pets) so if your rabbit is bigger than 2 pounds, you should really consider one of the carriers above. In some cases, your travel may require a portable and collapsible cage for your pet rabbit. 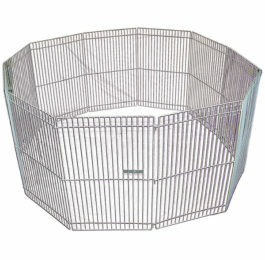 These cages are often smaller than the normally recommended rabbit cage but are perfect for travel situations. These are great for show rabbits or if you’re taking your rabbit with you on vacation. A travel rabbit cage should not be used as a permanent home for your rabbit as they are way too small, though you may find them helpful for temporarily housing a sick rabbit away from the rest of your bunnies or a good hangout for them while you’re cleaning their cage. 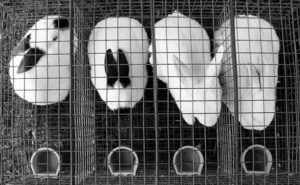 These travel cages should not be used for transporting your rabbit over long distances or riding in the car. Instead, you should purchase a carrier or kennel for your rabbit (like those recommended in the previous section) for car and air travel. Check out our recommended travel & collapsible rabbit cages below. The Wabbitat folding rabbit cage makes a perfect travel bunny cage or temporary cage. It sets up with no tools needed and is easy to fold down to store plate. The cage features top and front door access to easily get your rabbit in and out of the cage and the slide latch makes it easy to open and close the doors. The 1/2″ wire mesh floor features a removable waste pan underneath than can easily slide out for cleaning. Once nice thing about this model is that the bottom grate can be removed, which is recommended to prevent hock sores from developing on your rabbit’s feet. This model also comes with a urine guard you can install in the corner to prevent the unfortunate urine splatter some buns accidentally spray. There are two sizes of Wabbitat cages available in case you need a larger one to transport more rabbits. The smaller size will have plenty of room for one rabbit (or two dwarf rabbits) plus their litter box, food and water dishes, hay, and some toys. Another affordable option for traveling with your bunny is this wire dog crate. Though it isn’t specifically designed for rabbits, it meets the requirements for temporary rabbit housing at a great price. The wire cage features two doors for easy access and a solid pan floor to protect your bunny’s feet. The hook latch system will keep the doors securely shut and your rabbit safe inside. The cage folds down to a convenient carrying and storage size, plus it features a handle so you can carry it like a briefcase (check the Amazon listing to see the photo). Setup requires no tools and can be done in under a minute. Traveling with your rabbit can be a stressful experience, especially for your bun. However, there are a few things you can do to make the process as painless as possible and ensure a successful trip with your rabbit. When you’re traveling via car or plane, you should make sure to purchase a carrier that is the appropriate size for your rabbit, like the ones we recommend above. Inside that carrier, you should provide newspaper, towels, or other soft surfaces that they can sit on which can also absorb any urine. If the carrier size permits it, you can even put a small litter box inside to fill with newspaper or soft litter. Usually, rabbits are nervous or stress when they travel and they won’t want to eat. Even so, you should provide fresh hay in their carrier so they can nervously munch on the way. If you are driving, every 2 hours you should stop and offer your rabbit food and water. They may not eat, but they will often drink when it’s offered. Another option if your rabbit doesn’t seem interested in eating is to bring along a zip lock baggy of their favorite veggies. Wet the veggies and offer that to your bun, that way when they eat they will be able to hydrate with the moisture on the vegetables. 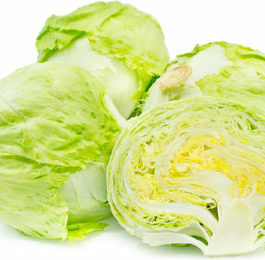 (Learn more about safe vegetables for rabbits.) These periodic stops will also allow them to calm down and be still for 10 to 15 minutes. If you’re flying with your rabbit, be sure to have plenty of hay in their carrier and offer them pellets, water, and veggies periodically during the flight. Don’t be surprised if they’re too stressed to eat when they’re flying. It’s often a good idea to offer them food and water before you board the plane and after you land when they are less nervous. Try to find a calm area without a lot of noise to let them relax.